Yvonne Buskie and Evy Horpestad Tjåland have been collaborating since 2011. ​June 8th 2015. All around Jæren the grass fields were being cut for hay and so too was the grass outside the Lalandhuset. We began by raking the cut grass into lines and finally into a small haystack. While raking we payed attention to the movements, memories, sounds and feelings we experienced. You were out there on my first day. So upright and green against the house so white. On my second day you were there again but you lay strewn with your blades cut. The gardener had mowed you down. 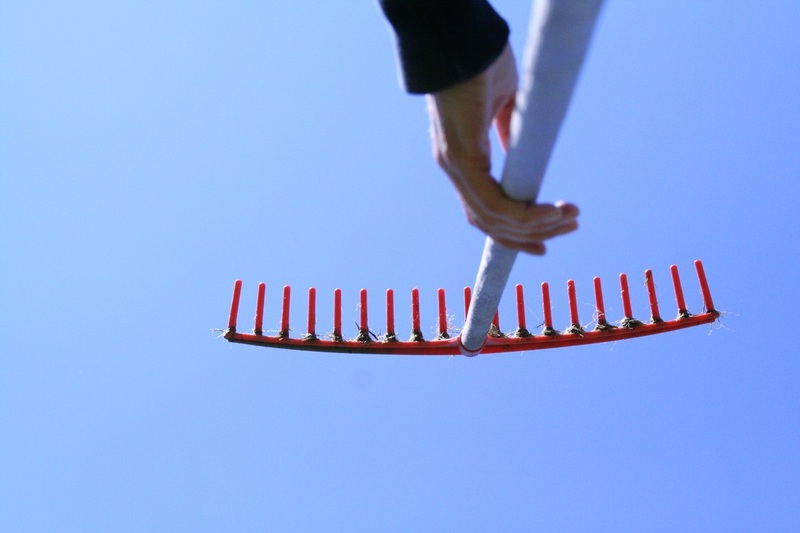 I borrowed a red rake to gather you up. I reached for you, took hold of you and pulled you to me. I heaped you together like you had never been before, blade stacked upon blade. I lifted you on to a chair. It seemed the right thing to do. You were sitting there for a quite a while in the evening sun, just sitting. I wondered what would happen to you when the sky lost the light. It was seeing the magpie that prompted me to bring you in. I’ve put you in the single room at the side of the house, overlooking the lawn, I hope you’ll sleep well. Thursday 11th June 2015, Buskie. I carried you in. Laid you down on the wooden floor. Bits of you clung to me. I felt contented looking at the squares of sunlight laying across you, casted shadows of the window frame. I left you there in the warmth and closed the door. I was out the whole day, cycling. The weather had been kind, generous even, hot sun with intervals of a cool breeze. I had stopped at the delight of seeing very young calves with their handsome mothers. They approached me at the fence, all looking as though I should tell them some expectant news from the other village, but I had nothing to say. Well apart from that they were lovely with their russet coats and such beautiful eyes. But this didn’t suffice and they moved off, the largest cow calling to the others, all who turned and followed her towards the trees. I had been sensible about using sun lotion but I could feel my skin tingle as I walked into the house. It was the smell of you that distracted me from going straight to the mirror to see just how badly I had burnt myself. Instead, I came to your door. I paused before the entrance, hand on handle, a nervous smile on my lips. What did I expect to see? Surely, you would be in the same position as when I had left? I opened the door and yes, you there were, only the sunlight had moved but the smell of you drying was the most noticeable thing in that room. Again I left you and closed the door. Friday 12th June 2015, Buskie. ​........and a second week by the sea. "Beyond the tipping point? Oxygen depletion in coastal marine ecosystems. Documented hypoxic (oxygen-depleted) zones, now more than 500 in the world, are doubling every year, causing fish mortality. Although it can occur naturally, hypoxia is most frequently caused by eutrophication, i.e., the overloading of waters with nutrients, especially nitrogen, phosphorous and silicon and/or organic matter. Major sources of this nutrient pollution are agriculture and livestock production, sewage and industrial waste, plus additional complex temperature and water exchange impacts from climate change. Nutrient effects on water oxygen levels are exacerbated when local water bodies become stratified and mixing of layers is prevented. The map shows the location of systems that remain hypoxic (red circles), systems that are eutrophic and therefore at risk of becoming hypoxic (yellow circles), and systems that have recovered from hypoxia (green circles), primarily through reduction of nutrient loads." A simple question is the sea alive or dead?